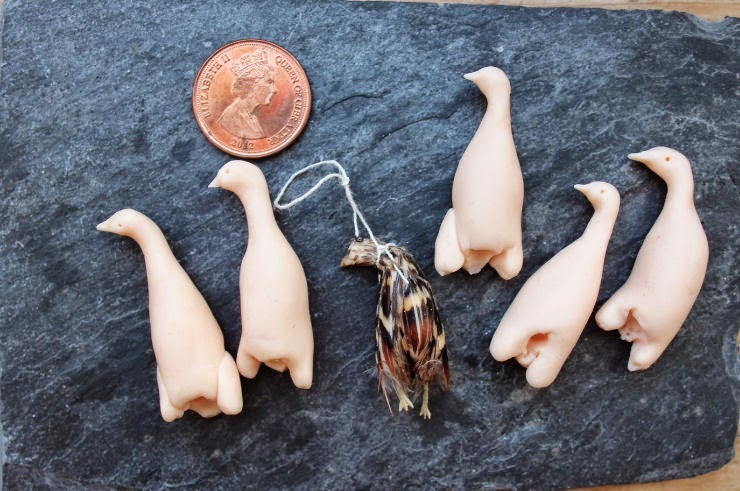 Medieval Morsels: Fair means or fowl? 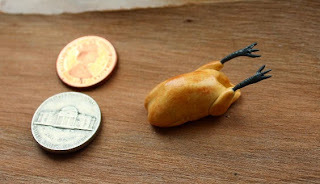 12th scale roast goose - the Medieval meal for Michaelmas, celebrating harvest's end. In England herds of geese were walked into London and other large centres of population in advance of seasonal fairs that marked the Church’s important religious festivals. “He who eats goose on Michaelmas day shan't money lack or debts to pay.” In Germany a fruit filled goose was eaten on high days and holidays, including Michaelmas (29 September). Nottingham’s Goose Fair (originally a “Goods Fair”) was granted a charter by Edward I in 1284 from the eve of the feast of St Edmund and for twelve days following. Michaelmas (autumn, fall) fairs were important for trade because town and country dwellers alike, rich and poor, had to stock up with goods, such as cheese and ham, against the risk of isolation and starvation during the dark days of winter. The change of name to Goose Fair was first mentioned in the Nottingham Borough Records of 1541. The fair typically saw the arrival of over 20,000 geese raised on the flat, low-lying Fenland in Lincolnshire and sold to provide the traditional Michaelmas dish. I used to live in Nottingham and seven centuries later the fair is still referred to as the Goose Fair. It offers mechanical rides amongst its principal attractions, but not live poultry. However I don’t remember if “hook a duck” stall was a “hook a gosling” stall. Obviously, it should have been. And what of the fowl in the title of this post? 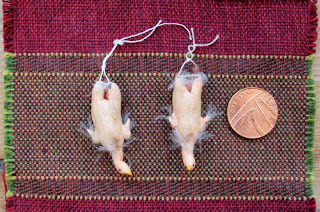 As well as modelling some more roast geese to replace stock, I have made MedievalMorsels’ first hanging chickens. 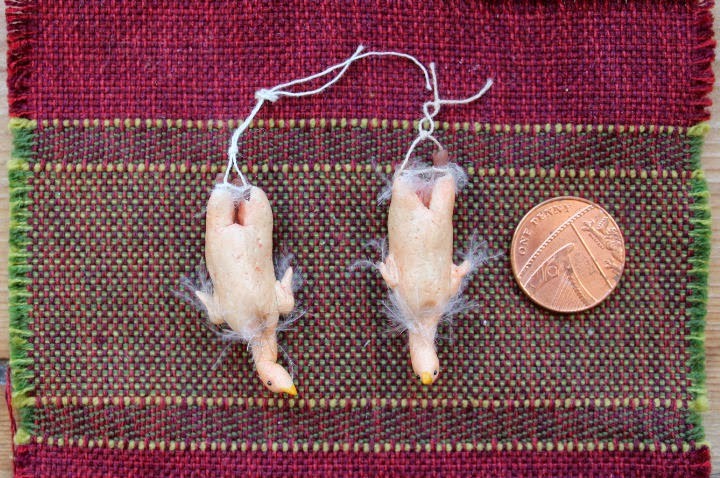 24th scale chickens to hang by MedievalMorsels, these ones cut off at the knee! A challenge because this was a custom order at half inch or 24th scale, much more fiddly! But it was good practice and now scaling up to the more typical 1:12 or 12th (one inch) should prove easy. But its not just chickens. For a while now, I have longed to model guinea fowl, I don’t know why. It may be something to do with the fact they have elegant plumage and proportions - long, blackish legs and a deep breast. They were popular with the noble classes, enjoying their heyday with the goose before the turkey reached Britain’s shores. They are sometimes to be found in English supermarkets and they taste very nice actually. But the real reason is probably that Caravaggio painting that lurks in my mind, its still life element includes guinea fowl and interesting “tear and share” bread! See what you think! So my first guineafowl is previewed here in this blogpost. I can’t offer it for sale in my online shop until I have made at least a brace (pair) of them. Last I have sad news about MedievalMorsels’ pheasants. 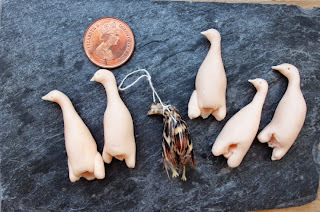 I have made more bodies but unfortunately I have clean run ot of feathers! I phoned an illustrious butcher who deals in game yesterday asking about the availability of feathers and was told to get back in touch in the game season, which starts for pheasants in September. Road kill it is then, although there is precious little of that in Swindon. I have asked friends and family to be on the look out. I guess I should provide the latex gloves!